Saudi Arabia’s petrochemicals sector is projected to grow by an average of 5.6 per cent over the next four years, as the kingdom accelerates development of large-scale downstream projects, according to the research consultancy BMI. Growth for the current year is forecast at 1.9 per cent, but project activity is expected to pick up as the country awards multi-billion dollar refining and chemical schemes in its upcoming industrial cities. “Saudi Arabia will continue to boost its petrochemical capacity in the years to come in response to growing demand as the country seeks to leverage cheap feedstock and lessen its economic reliance crude oil exports,” the Fitch subsidiary noted in its report. Saudi Arabia, the world’s biggest oil exporter has looked to boost its profit margins from the sale of complex products and plastics in growing markets across Asia. The oil price slump has encouraged traditionally oil producing countries in the Middle East to expand refining and chemicals capacities required to meet growing demand for chemicals. The kingdom is set to capitalise on growing demand for plastics at a time when excess refining capacity combined with tepid demand for refined fuels weighs on margins in the oil refining industry. Saudi Arabia, for instance, plans to nearly triple its existing petrochemicals capacity to 34 million tonnes in 2030 from 12 million tonnes in 2016. State-owned Saudi Aramco last month signed contracts to build integrated refining and petrochemical plants in its eastern industrial city of Jubail and also in western India. The $44 billion integrated scheme to be built with an Indian consortium in Maharashtra state will have refining and petrochemical capacities of 1.2 million barrels of crude and 18 million tonnes per year of products respectively. 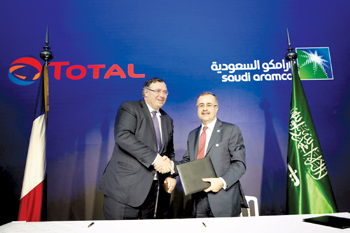 Earlier last month, Aramco and France-based Total announced a joint venture to build a $9 billion petrochemical complex to the existing Satorp refinery in Jubail. Aramco owns 62.5 per cent of Satorp, while Total holds a 37.5 per cent stake. The proposed investment comes on the heels of a recent uptick in petrochemical-related project activity, following a preliminary agreement between Aramco and Sabic to conduct a joint feasibility study on developing a $30 billion oil-to-chemicals project in Yanbu. According to the report, these investments align with several Saudi government goals such as expanding petrochemical production to 34 million metric tonnes by 2030 from 12 million in 2016; moving Aramco further up the hydrocarbon value chain; and attracting private investment into the country’s infrastructure sector. “Given the confluence of interest underpinning petrochemical investment in Saudi Arabia, we expect similar investment pledges to proliferate in the coming years,” BMI Research said.